Would you like to transform the entire appearance of your smile with a single cosmetic dental treatment? A few of the greater advantages of porcelain veneers is the fact that they can solve so many dental problems at the same time including: discolouration, misaligned teeth, cracked teeth, and gaps in your smile. In many cases, cracked or weakened teeth will no longer need to be replaced after porcelain veneers are applied since the veneer can act as a splint once a tooth has been stabilized. 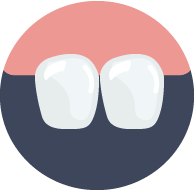 With proper care, porcelain veneers can even help protect your teeth against decay. For example, teeth that project too far backward or forward can be reshaped by our dentists so when veneers are applied, the arch of your teeth improves, making your smile not only more attractive, but more functional. Porcelain veneers can also help whiten your smile. When replacing an entire smile line, all of your veneers will be matched to a bright, natural color. The translucent quality of each veneer allows light to pass through and reflect off your natural teeth, giving your smile a lustrous aesthetic depth. The non-porous surface of porcelain veneers also helps protect against future stains, maintaining the beauty of your smile for many years to come. Are you apart of Health Fund and have an active insurance plan which includes dental + extras? There are several treatments that are covered under your health fund which means you will pay a NO GAP fee or partial payment depending on the kind of treatment you are pursuing. Dental Veneers are a core part of cosmetic dentistry. Dental Veneers are long lasting.